Armstrong Steel, a Greenwood Village, Colorado based Original Equipment Manufacturer of metal building kits was contracted by Jean Schneider to design her 40’ x 30’ barn for boat, bike, and recreational equipment storage. Jean was originally looking into a polebarn but ultimately chose Armstrong Steel based on customer service, price, and the quality that comes with pre-galvanized secondary framing. Armstrong Steel Buildings was delighted to add Jean's barn to the growing number of structures they’ve delivered to Wisconsin. Houlton, Wi. - Armstrong Steel, a Greenwood Village, Colorado based Original Equipment Manufacturer of metal building kits was contracted by Jean Schneider to design her 40’ x 30’ barn for boat, bike, and recreational equipment storage. Jean was originally looking into a pole barn but ultimately chose Armstrong Steel based on customer service, price, and the quality that comes with pre-galvanized secondary framing. Armstrong Steel Buildings was delighted to add Jean's barn to the growing number of structures they’ve delivered to Wisconsin. 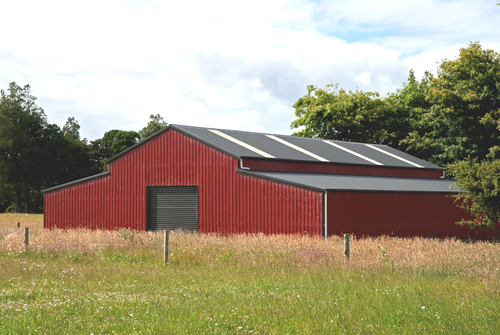 Though Armstrong Steel frequently sells steel barn kits, Jean’s design was unique in that it incorporated a less traditional pre-engineered steel building roof pitch of 12:12. This was no problem for Armstrong’s fast and efficient pre-engineered metal building experts. When Jean called Armstrong Steel, she was able to get exactly what she wanted in no time. “She knew right away that she wanted to work with us, and has sent numerous photos of her progress on the barn,” says Kitty Uhle, Delivery Coordinator. Jean elected to have Armstrong ship the pre-engineered building to her jobsite so that she could easily manage her own build out. Jean has been constructing the barn on weekend time and the metal building barn will be completed in less than two weeks time. "As I began searching for a steel barn, there was one company in particular that went out of their way to say some outrageous things about Armstrong Steel and desperately used scare tactics in an effort to change my mind. I'm glad I wasn't influenced by the lies. Everything has gone great, I couldn't be happier with Armstrong Steel and the way my building is going up! They have been there for me every step of the way." says Jean Schneider. Don’t fall victim to the false and divisive methods of some competitors! It is not surprising that the attacks these smaller companies are launching lack any credibility. Armstrong Steel has always been committed to delivering the highest quality building on the market at the very best price possible. The only way to mislead consumers about Armstrong’s reputation is to resort to dishonest and overtly divisive smear campaigns that do a disservice to consumers who deserve to know the facts. Over the past several years, there have been so many steel building companies closing their doors and taking people’s deposits with them. Don’t be enticed by the lowest price. Often times, these companies are the wolf in sheep’s clothing - just after your deposit. Don’t risk your project on anything less than Armstrong quality. For a cost effective, do it yourself solution similar to Jean’s, call Armstrong Steel today. 95% of steel building companies are just brokers. Brokers are simply middlemen who order buildings on your behalf solely based on width, length and height dimensions. Beyond that, they hand over all quality control of your building to the cheapest bidder. Armstrong Steel is an Original Equipment Manufacturer (OEM). Armstrong Steel staffs in-house draftsmen and detailers that work solely on your Armstrong Building. Armstrong Buildings are unique as they are in control of the stringent specifications, measurements, standards, and guidelines for every single piece of your building: all individual primary members, secondary members, connections, clips, and weld specs in your Armstrong Building. The fabricators tasked with abiding by Armstrong’s strict standards are all reputable, publicly traded companies that have been in business for many years. The sheer volume of material Armstrong Steel purchases from these mills allows them to pass along the absolute best pricing in the industry. “Regardless of a customer’s location or desired building size, Armstrong Steel remains an extremely cost effective building solution. 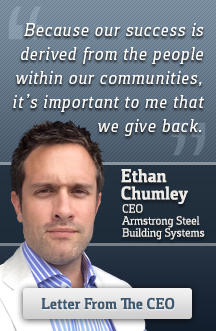 This do-it-yourselfer's success proves that no matter how big or small the project, Armstrong gets it done.” says Ethan Chumley, President of Armstrong Steel. Need space? Call Armstrong Steel: America's most trusted name in pre-engineered steel.